All of the suites were put together in the order of invitation, detail card, RSVP envelope and RSVP card held together twine and a mini moo card with our photo on one side, and our website information on the other. When I was designing the suite, they originally had a kraft colour for a majority of the pieces. 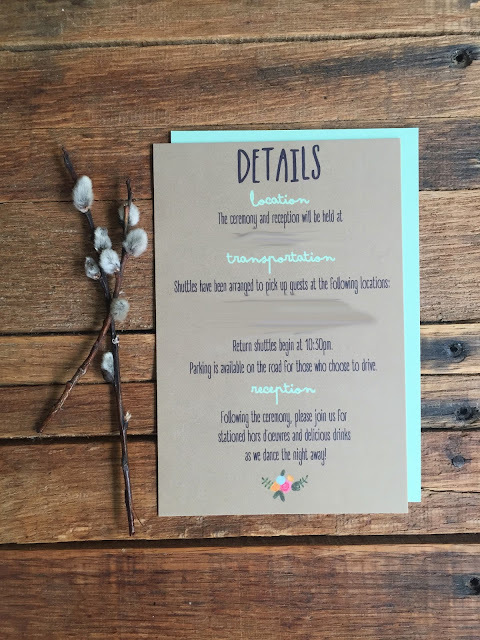 Something didn't feel quite right, so I switched the invitation and RSVP to white, and kept the details card kraft, and everything finally clicked and it felt complete. Our mini moo cards were one of my favourite touches. We used four of our engagement photos, each with a different feel/backdrop. I loved selecting the picture for each of our guests. 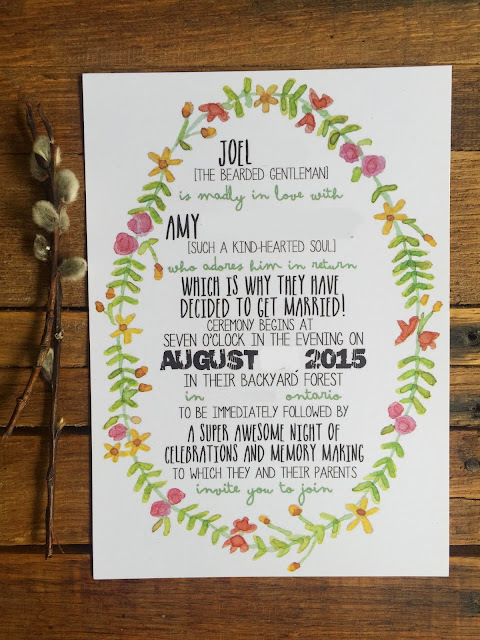 Largely drawn from our inspiration, the wording on our invitation is my most favourite part. Mr. Narwhal and I each came up with each others tag line, and spent a bit of time brainstorming how to phrase the celebrations. We wanted to keep it casual and fun, and I really think we achieved the perfect invitation for us and our wedding. Again, we wanted our RSVP to have a fun feel. We have given our guests the option of mailing their response, or responding on our website. It will be interesting to see the ratio of website responses versus paper. So far, we have a 2:1 ratio with the web responses winning (#notthinkingaboutthewastedstamps). Our detail card was our opportunity to share some of the most important information with our guests. Since we have limited parking available, we would like to encourage most people to utilize our shuttle bus, and we also wanted to reiterate our cocktail style reception. At this point I think we have told everyone that we will not be having a formal dinner, but wanted to be clear within the details of our invitation suite. Everything on our detail card is given in more detail on our website. These were certainly a labour of love, and one of my most favourite wedding projects thus far. I'm very happy with how they came together. 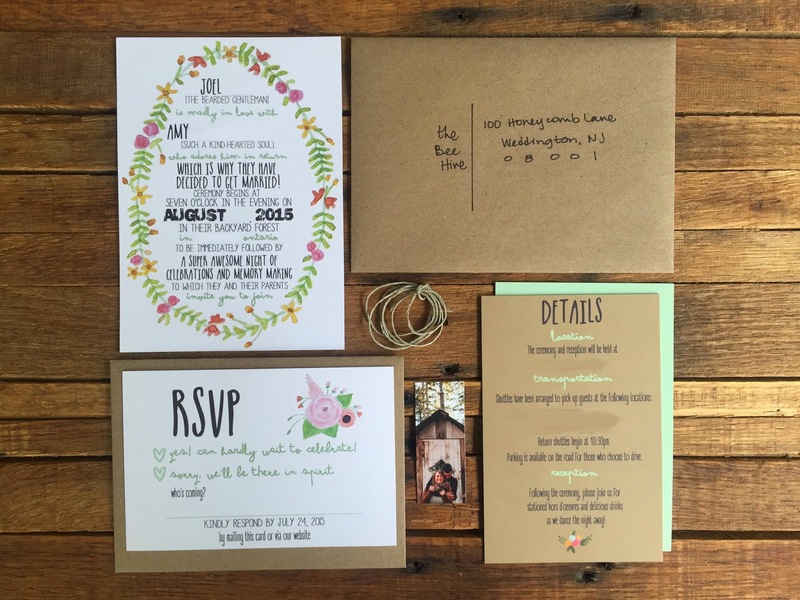 Nothing makes your wedding feel more real than sending off the official invitations. We have invited 156 people to our home, and we couldn't be more excited about it. Next, I'll give a cost breakdown and source everything we used. Did you design your invitation suite?